In this next installment the local werewolf pack get Anita to find out what happened to their missing pack members. I loved this fifth book, it has to be my favorite in the series so far!! Anita is back and as ever she is fighting the bad guys-- and in trouble. In this one we have a lot going on between Richard and Anita, things seem be going good and getting serious. Then of course stuff happens and we find Jean-Claude in the picture. So we definitely get a lot more of her love life and some hints about what is coming in the next book. The plot in this one was fast-action-packed-excitement with the element of mystery. 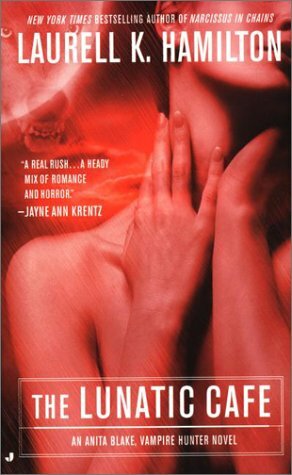 I think this book does expand a lot more on the werewolves which I really liked and some on the vampire elements as well. That being said I found the stuff we learn about going on between Richard and his Alpha very interesting. It is definitely set up to be expanded on in future book(s), so I am looking forward to seeing what will happen. There also wasn't as much talk about zombies in this book, I don't know if it was a good thing or bad. I have to mention it-- We again have Edward in this book (Yay!! Anyone else want a book about just Edward? Just me? *Sigh*) and he is just as dangerous sounding as ever. I highly recommend this to Anita lovers and would also recommend for paranormal lovers.